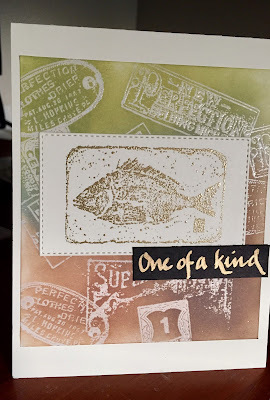 Playing along with Simon Says Stamp's Monday challenge (#sssmchallenge) for masculine cards. I made the emboss resist background using Tim Holtz Distress Oxide Inks over Stampin Up's Aged to Perfection set embossed in white. I embossed the fish stamp in gold then hand-lettered the sentiment on black cardstock. I love the embossed effect and on this card it's perfect. Great masculine card for our challenge! Thanks for joining us on the Simon Says Stamp Monday Challenge.